We might be able to fake leadership in breezy weather, but dark seas are bright lights. The way you deal with problems is more important than the problems themselves. Tippy-toe leaders worry about personalities, politics, and public perception. You can’t ignore these issues. Just don’t make them central. Tippy-toe leaders prolong problems by producing tippy-toe solutions. Cure: Stretch your candor muscles behind closed doors with trusted colleagues until you feel confident enough to address tough issues head-on in public. Drama-making leaders spend more energy complaining about problems than actually working to solve them. They just can’t believe this could happen. Drama-makers aggravate problems by adding heat. Use the energy of stress to turn your attention to solutions. Hide tough issues from higher ups. Have things in control, when they’re actually covering their butts. Sadly, in dysfunctional organizations, face-savers succeed. 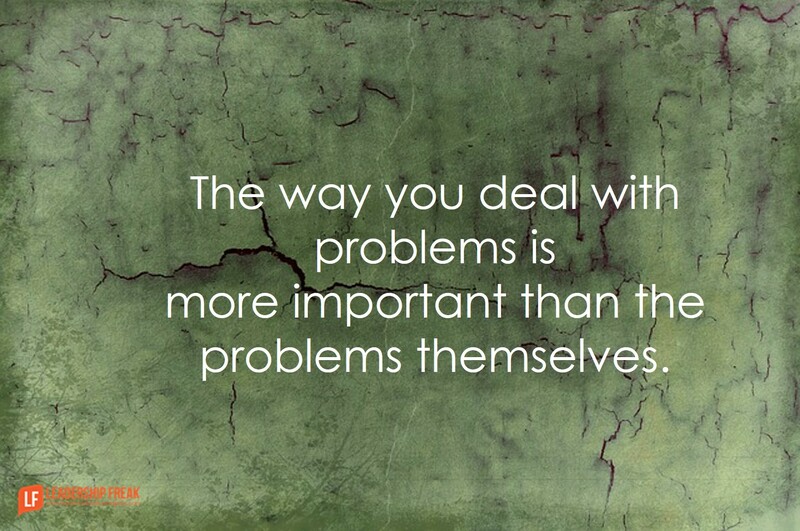 Cure: The best way to save face is to own problems and work toward solutions, even if the problems aren’t your fault. Be known as a solution provider, not a self-protective face-saver. What have you already done to solve this problem? How are customers impacted by this problem? What internal teams/individuals are impacted by this problem? What do you assume is true? Who needs to be part of the solution? What dysfunctional problem-solving strategies have you experienced? What problem-solving tips might you suggest? My boss is the face saving type but also gets bogged down by the minutea and is not decisive. Meetings with this boss can be long and unproductive even when steps are laid since I don’t trust that she will carry them out. Suggestions? Thanks Viviana. Your situation sounds doubly deadly. How do you bring up an issue that might cause a face-saving leader to lose face. My first thought is to bring it up in private. Before bringing anything up, you might reflect on the boss’s strengths and career goals. How can you get on their side of the fence. An adversarial relationship with the boss is something to be avoided, if possible. I also think about working on specific suggestions to make things better. What about you? What comes to your mind? I recently had a meeting with her. When I saw that she was getting bogged down with the details, I switched to another example along the same theme. The flow changed immediately. From there I would see where she would think one way and I would try to steer it to where it can be seen another. We did set some groundwork. It seems that I need to get her to see the bigger picture (how it will benefit us and her) and keep the conversation flowing. Someone told me it’s called managing up though it feels a bit 8t like behavior modification. Very informative post. Perhaps one helpful addition would be to encourage leaders to identify the actual problem. Often times leaders get deeply involved with the systems of a problem and fail to address the main issues. Thanks Russell. Great point. The rush to solve problems is an issue when it cause leaders to neglect defining the problem. there are two kinds of problems (from systems theory perspective) – one, which has a root-cause and the other which doesn’t (it’s called a “mess”). Systemic issues cannot be solved by creating a focus on an “issue”. While microcosmic cultures can be created in teams, if the organizational culture doesn’t support – such effort would not help. Great typology of some dysfunctional leadership styles! I have also been frustrated by “head in the sand” leaders who refuse to acknowledge a problem or warnings of an impending problem until a crisis is imminent. “Whistling past the graveyard” is also a term I have used to describe leaders who know a potential disaster is building over some vital issue, but choose to think happy thoughts and ignore taking preventive or corrective action on the chance that “maybe” everything will be okay. Your “10 Possible Questions” should enable us to methodically zero in on problems and find apt solutions, if conscientiously applied. Thanks Jim. Great additions. Love the whistler metaphor. With markets as competitive as they are, we can’t have dysfunction in leadership. The root is culture. What you allow will continue.What I hear from teams that act as you describe is “culture is too hard to change” so they don’t address the real issues. They tip toe around real issues that need to be discussed and addressed strategically. What are your thoughts about teams who know they have a culture problem but do not address it because they think it is so hard? What are the costs if they don’t? Levy’s Nut Island effect in HBR and Jerry B. Harvey on Abilene Paradox are two common dysfunctions of teams. Dan’s method of candor, and “appropriate confrontation” are straightforward mitigations of such risks. Candor while beneficial must be shared with tact and responsibility for their impact. Some people boast in their ability to be candid and use it without hesitation and claim the old “just saying” stance, claiming no responsibility.